Every year Montblanc releases the famous Writer Series Limited Edition Pens. For past 3 years they have been releasing the famous Writer Series Ink Bottles in limited quantities to match with these writers series edition. All of the writer series inks have shown some wonderful colors and have been an instant hit with the customers. The Carlo Collodi Brown ink bottle, Jonathan Swift Sea Weed Ink bottle has been an instantaneous hits with customers. Customers still ask for the Carlo Collodi Brown ink but alas they are sold out and in fact one customer bought 24 of them to keep them in stock. So what makes Montblanc Writer Series Limited Edition ink so special? Well for one they are a perfect match to the Limited edition series. I would say it should be included with the purchase of the respective Montblanc Writer Series limited edition pens and that is exactly what we do it also ( as long as it is in stock since the ink fanatics ( me! me!) can really empty those shelves in no time). Another reason is the lubrication of these inks are fantastic. They are a perfect companion for your Montblanc fountain pens and in fact any of the fountain pens. They do flow easily, so those with heavy flowing nibs have to be aware. Their drying time is pretty good ( please see the image with smearing done in 1 seconds, 5 Seconds). But I think the best reason that they are so famous is that the ink colors so far has been outstanding and have special meaning towards the author. 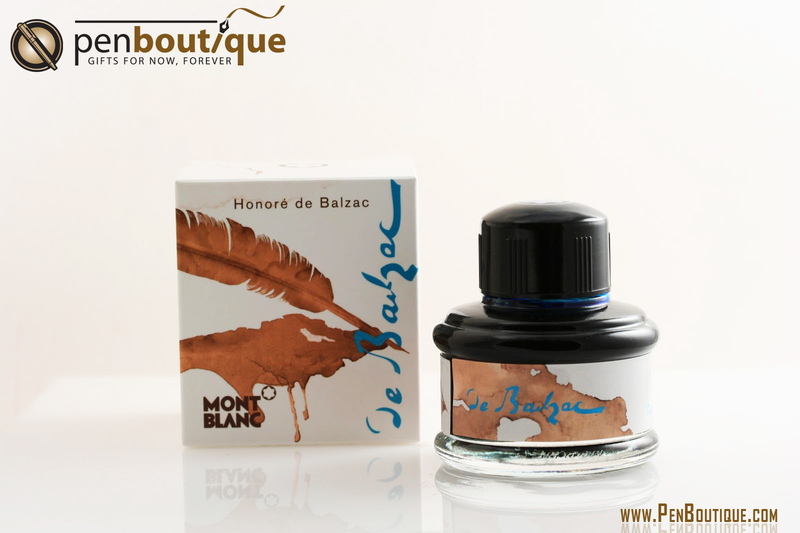 This year's writer series limited edition - 2013 is in the honor of Honoré de Balzac. It is an interesting choice by Montblanc as some of the work by this author has been banned from some countries. But I guess above all it is the author and the hard work that writers put forth which needs to be accounted. The ink for the Limited Edition 2013 is nicely called Dandy Turquoise ink ( it was initially marketed as Sandy Turquoise ink, but then in the end it was decided to be Dandy. So it is all sandy-dandy!). 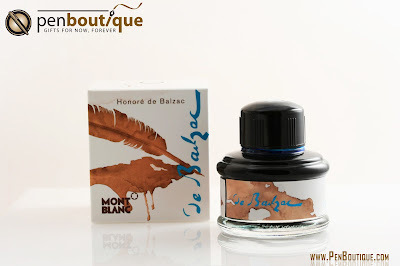 The turquoise is a beautiful shade and if you remember the discontinued Montblanc Turquoise ink, it is a little shade darker than that. There is no or little feathering of the ink. I have given a sample writing with the ink on my favorite Rhodia Meeting book on 80g Clairfontaine paper. Rhodia papers are usually very ink resistant and does take little bit of extra time to dry. The plus side is that you can use both sides of the paper with a fountain pen with some smooth writing. The pen used for testing is Pelikan M200 with Italic Nib. The ink is beautiful and the picture does not do full justification especially if you love turquoise color. The bottle is a nice thick bottle just like the Jonathan Seaweed Ink bottle. Get this collectible bottle of ink today while it lasts. Believe me they are worth it.